Red, white and blue wafer paper cookies! 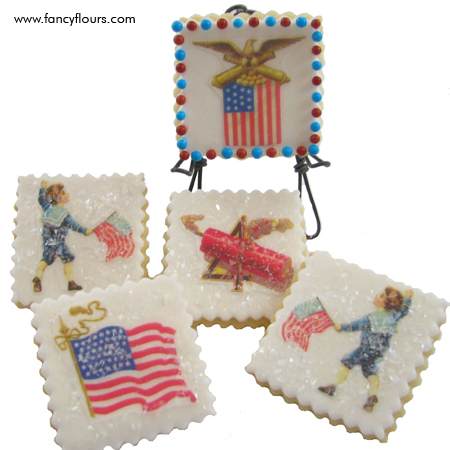 Celebrate America’s birthday with a stunning batch of sugar cookies complete with patriotic wafer paper designs. If you haven’t tried wafer paper – don’t worry – it is easy to use and you get great results. View our complete how-to guide for these mini wafer paper cookies. You can also try using edible glitter to give the cookies a little bit more shine. Also try our project of the week – featuring patriotic cupcakes with our red pisa muffin cups and Lucks’s brand royal icing star decorations. Simple. Delicious. Classic. 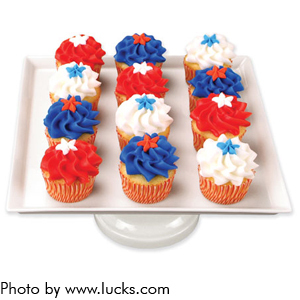 A mini cupcake is the birthday finger food for a 4th of July party or BBQ. View all July 4th product HERE. This entry was posted in Cookie Recipes & Ideas, Cupcake Recipes & Ideas, Summer Fun Baking and tagged Cookie Recipes & Ideas, cupcakes, edible glitter, July 4th, muffin cup, Patriotic, pisa, star, sugar cookie, wafer paper by Fancy Flours. Bookmark the permalink.